[JRASERVER-59980] JQL filter for Webhooks doesn't work correctly when "Comment" and "Worklog" related events are fired - CVE-2017-18104 - Create and track feature requests for Atlassian products. The Webhooks component of Atlassian Jira before version 7.6.7 and from version 7.7.0 before version 7.11.0 allows remote attackers who are able to observe or otherwise intercept webhook events to learn information about changes in issues that should not be sent because they are not contained within the results of a specified JQL query. 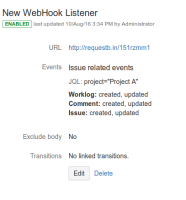 JQL filter for Webhooks dosn't work correctly when Comment or Worklog related events are fired. The webhook shouldn't be fired. the JQL filters the events correctly.